Showcasing a flared pedestal base supporting a gorgeous book-matched veneer tabletop is this beautiful transitional style dining table and chair set. A pair of 18" table leaves allow you to easily transform your dining space from the perfect space for everyday meals to the ideal spot for hosting a dinner party or a holiday meal. Upholstered dining side chairs show off a radiant veneer pattern on their oval chairbacks in addition to the neutral toned fabric to create a unique personality. Both dining chairs and table are finished in a gorgeous dark brown cherry, this elegant table and chair set is sure to transform the look and feel of your dining space. 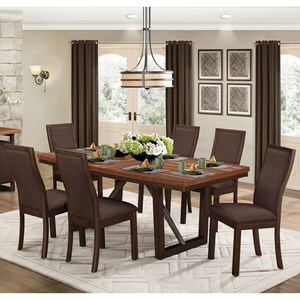 The Delavan Transitional Dining Table and Chair Set by Homelegance at Beck's Furniture in the Sacramento, Rancho Cordova, Roseville, California area. Product availability may vary. Contact us for the most current availability on this product. Finish Finished in a dark brown cherry. Case Construction Constructed of wood veneers and solids. Transform the look of your dining space when you bring home the gorgeous transitional style pieces of the Delavan collection. Finished in a rich brown cherry, each piece in the collection uses a patterned veneers to create a uniquely elegant look. Side chairs add to the unique look of the collection by creating a two-tone look by pairing the beautiful finish with a neutral toned fabric. The Delavan collection is a great option if you are looking for Transitional furniture in the Sacramento, Rancho Cordova, Roseville, California area. Browse other items in the Delavan collection from Beck's Furniture in the Sacramento, Rancho Cordova, Roseville, California area.